"Armor worn by fierce phantoms, feared even by heroes, is hidden in the ruins of Hyrule Field. Find these pieces at a battleground where brave souls tested their skill..."
The helmet can be located on the bottom floor of the coliseum north of the Great Plateau. Watch out for the Silver Lyonel patrolling the bottom floor as it packs a punch. The chest can be found against the Northwest wall. If you aren't able to beat the Lyonel, wait for it to patrol away and then sneak over to the chest and lift it out of the ground with the Magnesis rune before making a quick getaway. Like the rest of the Phantom Armor, the Phantom Helmet boosts your attack power. The chest piece for this set can be found at the Sacred Ground Ruins, which you may have visited before as it is also the location of one of the forgotten memories. The chest is hiding along the southern edge of the paved circle, slightly submerged in water. Use the Magnesis rune to dig it out. Lower level players should be cautious approaching this area as there are patrolling guardians in the fields nearby. As with the helmet, the Phantom Armor puts a little bit of mustard on your attacks. Start by heading over to the Hyrule Garrison Ruins, taking care not to grab the attention of the patrolling guardians in the surrounding fields. The chest can be found hiding just next to a dead Guardian at the southeast edge of the town. Use the Magnesis rune to lift the chest out from under the guardian. Guess what: these here greaves make your attack power go up a little bit. Shocker! 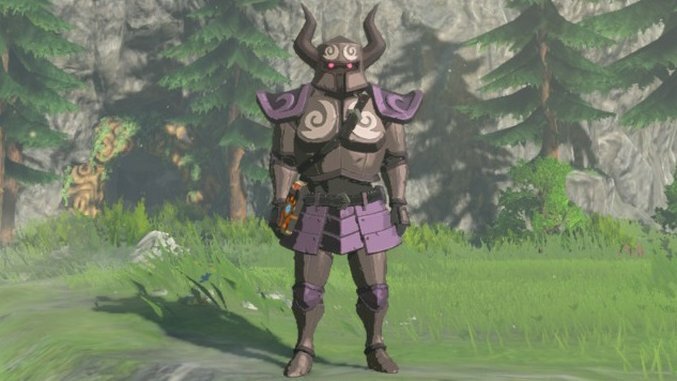 When the full set is equipped, you don't just get a pretty solid uptick in attack power; you also get to cosplay as one of the most stressful bad guys in the entire Zelda canon. The first of The Legend of Zelda: Breath of the Wild’s DLC packs has finally dropped, and with it comes a bunch of new armor pieces and items to help spice up your adventures across Hyrule. Finding these lucrative new items items is no easy feat however, as each piece of DLC treasure has been scattered across the wilds with nothing more than a series of vague clues to point you in the right direction. Fortunately, we’ve already scoured the land and found every piece waiting to be discovered. The Phantom Armor set is, along with Tingle’s outfit, one of two separated armor sets included in the new DLC. It can be found scattered across multiple areas throughout Hyrule. Here’s how to find every piece of it. Andy Moore is a gaming freelancer based in the UK. When he’s not writing, he can be found staring blankly out of the nearest window, or spending way too much time on Twitter.